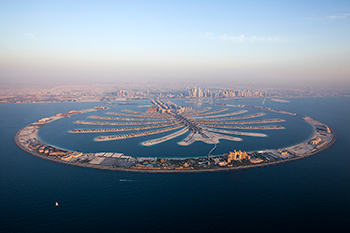 The Palm Jumeirah ... showcased at Nakheel’s stand at Mipim. Dubai-based master developer Nakheel showcased a plethora of real estate investment opportunities – including newly-launched residential projects worth more than $15.8 billion – at the Mipim real estate expo in Cannes last month for the fourth consecutive year. Nakheel returned to the French city to further build its international investor portfolio, which already comprises nearly 30,000 global clients, including 3,500 from Europe, with investments totalling $35 billion, says the company. Two new Nakheel projects offered at Mipim this year were Dragon Towers, a twin-building, high-rise apartment complex at Dubai’s Dragon City community, and Jumeirah Park Homes, a collection of four-bedroom terraced homes at the high-end Jumeirah Park community. A range of other properties were also available, including luxury apartments in The Palm Tower on Palm Jumeirah; ready homes at the waterfront Azure Residences, also on The Palm; high-end homes at Al Furjan and land plots at Deira Islands and other prime locations across the city. Meanwhile, Kleindienst Group, the UAE’s largest European property developer and creator of The Heart of Europe, showcased real estate investment opportunities worth $5 billion during its debut appearance at Mipim. These included The Heart of Europe, its innovative freehold second home development and global tourist destination valued at $5 billion located on six islands in The World archipelago in Dubai.